There’s a rare event happening in bitcoin. Like World Cup soccer, it only comes around every four years. But you can’t wait until it happens. You need to prepare months in advance. 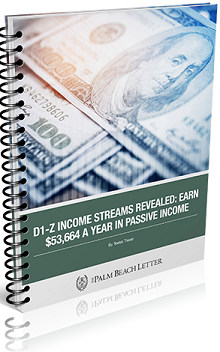 If you’d positioned yourself ahead of time in 2011, you could have made 11,645%. And if you’d positioned yourself beforehand in 2015, you could have made 7,382%. Today, I’ll explain what this important event is. 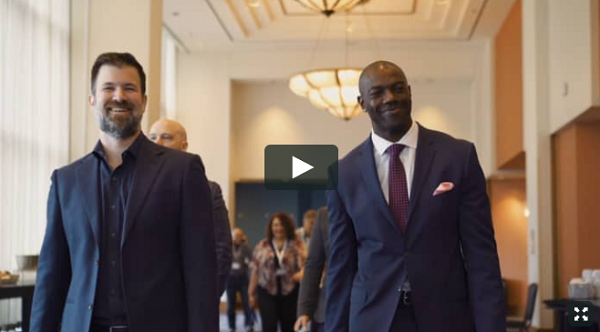 And more importantly, while most people will tell you to wait until it unfolds, I’ll show why you want to position yourself well ahead of this money-making opportunity. CLICK HERE TO CLAIM YOUR SPOT – IT’S FREE! There can never be more than 21 million bitcoins in existence. The issuance is strictly regulated by computer code. Every 10 minutes, bitcoin “miners” compete with each other to solve a complex mathematical problem. Whoever solves the problem first is awarded 12.5 bitcoins. A halving event is when the bitcoin reward gets cut in half. So each halving reduces supply coming to the market. The first halving occurred in 2012, and the second in 2016. The third will occur in 2020. 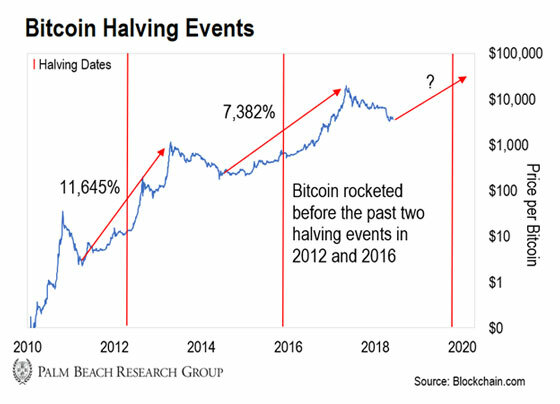 When that halving event occurs next year, the bitcoin reward will drop from 12.5 to 6.25 bitcoins. Over a year, that will drop the supply of bitcoin coming to the market from about 675,000 to about 337,500. The halving will continue roughly every four years until all 21 million bitcoins are released. As I mentioned, the next halving is estimated to occur in May 2020—about 16 months away. As you can see in the chart above, bitcoin bottomed roughly 15 to 16 months prior to each of the first two halving dates. But it rallied for a year or more after them. That’s why you don’t want to wait until the halving date to buy bitcoin. And if you invested 15–16 months prior to the second halving, you would’ve made 158% more than waiting until the halving date. Let me put that in dollars for you: $100 invested in bitcoin on the second halving date would’ve made you over $2,800. But that same $100 invested 15–16 months earlier would’ve made you over $7,300. And this next halving is coming at an incredible time, too. We’ll see reduced supply right before demand explodes. Today, there’s roughly 35 million crypto investors. And Wall Street is moving full steam ahead to open up crypto to the 500 million stock investors worldwide. That’s almost 15 times the current number of investors. You wouldn’t know this demand was coming simply by watching bitcoin’s price action. But beneath the surface, the groundwork is being laid. Take Fidelity Investments for example. It’s in the process of launching Fidelity Digital Asset Services. The new company will offer trading, storing, and security of digital assets. And its goal is to make cryptocurrency more accessible to investors. Another example is Bakkt. It’s the institutional-grade digital currency platform being operated by the owners of the New York Stock Exchange. Then there’s ErisX. It’s a competitor to Bakkt being backed by industry heavyweights such as Cboe Global Markets, TD Ameritrade, and Nasdaq. Germany’s Boerse Stuttgart—one of the top ten 10 largest exchanges in Europe—will launch a crypto trading exchange in the first half of 2019. Japan’s Mizuho Financial Group plans to launch a digital currency to promote cashless payments. It has 60 domestic regional banks on board. And CoinfloorEX, a division of the UK’s cryptocurrency exchange Coinfloor, is planning to offer physical bitcoin futures to Asian markets. As I showed you, investing far head of the halving window can lead to much bigger gains than waiting for the halving to occur. So now is the optimal time to buy. Not only do we have the halving catalyst that will cut supply, but institutional greed will boost demand up to 15 times. When supply drops and demand rises, asset prices have only one direction to go: up. The next leg up could see bitcoin surpass its old highs. Prepare today. And always remember, bitcoin is volatile. So don’t bet the farm. You just need a tiny grubstake for the potential for life-changing gains.